John the Baptist is a very special character in all four gospels. In Mark, God says he is sending off John, his angel/messenger, before the face of Jesus who will build down a straight path for him (Mk 1:2). Matthew says "if you are willing to accept it, John (the Baptist) is Elias (Elijah), the one about to come (Mt 11:14). 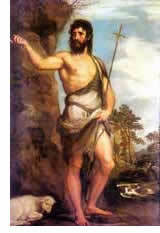 John the Baptist will even dress, eat, and live like Elias (Mk 1:6). John the Baptist will take the place of Elias to "come first" to herald the arrival of Jesus Christ as the Messiah as predicted by the Old Testament prophet Malachi. There was just one slight problem, John the Baptist would not be recognized by the people as Elias. Jesus said ... "Elijah comes and will restore all things. But I tell you, Elijah has already come, and they did not recognize him, but have done to him everything they wished. In the same way the Son of Man is going to suffer at their hands. Then the disciples understood that he was talking to them about John the Baptist (Mt 17:11-13). Like John, Jesus would also not be recognized by the people as the Christ, the Son of God. However, If you view the gospels as gematria stories, every single story is a parable and every single character is represented as a sign. The above diagram shows John the Baptist as a circle with a circumference equal to the gematria value of his name. He also has another sign not shown in this preview. This sign "comes first" to prepare "the way" of the Lord and to make his paths straight." Elias was the only person in the Old Testament who was raised by God's angels who drove a chariot up into heaven (2 Kings 2:12). This diagram shows how the gematria value of John's name is linked to the raised Jesus (8880). John will go on to anoint Jesus with the water of the Jordan river, the water from which Elias went straight up to heaven in a whirlwind (2Kings 2:11). The River Jordan is the easternmost border of the Holy Land, the river which just happens to run straight down from North to South, like the straight path prophesied in Mk 1:2, the River on which the Sun (318, 388) first rises. The above diagram shows John the Baptist (2220) as a circle with a circumference equal to the gematria value of his name. Directly over each of his names is a pair of circles representing the sign of the sun. One circle has a diameter of 318 units, the gematria value of "helios" (sun). The other circle has a diameter of 388 units, the gematria value of "ho helios" (the sun). This diagram shows how John's name and the sun are linked to the raised Jesus (8880). John the Baptist and "the way"
The above diagram shows John the Baptist (2220) as a circle with a circumference equal to the gematria value of his name. Directly over his name is a path of interlocking circles representing "the way." Each circle has a diameter of 352.888 units, the gematria value of "he hodos" (the way). The fit is virtually perfect to the unaided eye. The diagram shows how John's name and "the way" are linked to the raised Jesus (8880). Truly I say to you ... there has not been raised of those born of women greater than John the Baptist. ... For all the prophets and the Law prophesied up to the time of John. And if you are willing to accept it, he is Elias ... the one about to come. The one having ears, let him hear (Mt 11:9-14). It seems that late first century Jews were not "willing to accept nor to recognize" that John the Baptist was Elias even though Jesus said he was. In the gospel of John (Jn 1:19-25), the Jews from Jerusalem (Priests, Levites, and Pharisees) ask John the Baptist who he is. John answers "I am not the Christ." The Jews then ask him "are you Elijah? John truthfully replies "I am not." The Jews then ask him again if he is "the prophet" and John says "no." John was acting in place of Elijah through the power of gematria. In Mark's story of the transfiguration, John the Baptist is revealed through gematria as the prophet Elias in eight different verses. In the sacred geometry story of the crucifixion, death, and raising of Jesus, John the Baptist, as Elias, comes to restore all things just as Jesus predicted in the story of the transfiguration (Mk 9:12)! John the Baptist and Elias are the key to solving other Gospel mysteries and tying up some "loose ends." This book will show you the answers.